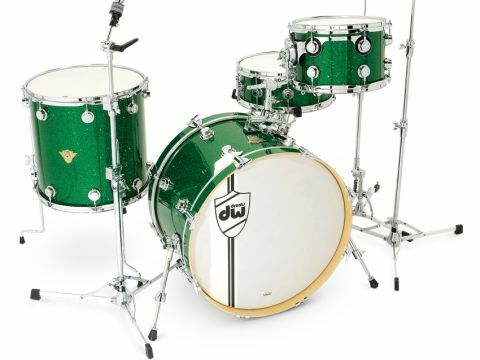 There is undoubtedly a market for vintage drums, but the real thing is getting more rare. You can still find decent '50s/'60s Radio Kings or Ludwigs for considerably less than DW's Classics, but they may well be fragile, not always round, while the hardware borders on useless. By investing in a brand new Classics kit you get a more solidly built, road-worthy set. Comes with typical DW savvy. Vintage style but with cleverly updated attributes which modern drummers seek. It's crafted to order = expensive. No vintage inlaid hoops. Many drummers hanker after the classic sound and look of vintage drums. But drum kits from the golden days of jazz and rock are increasingly rare and expensive. They're also often too fragile for today's heavier use. DW seeks to plug this gap with its Classics series. DW drums evolved from Camco with thin maple shells and internal reinforcing rings. Modern DW drums are still maple, so for the Classics, DW went for the mahogany-poplar-mahogany sandwich with thick reinforcing rings and rounded bearing edges which characterised the original Gene Krupa 1930s Slingerlands, right through to Ringo's Ludwigs in the '60s. DW's Scott Donnell says, "Knowing that our Collector's Series are considered very modern sounding, we decided to really hone in on what made those older drums so desirable." DW already had the Jazz series featuring retro maple and gum shells, and Scott explains, "Classics provide a '30s through '50s sound, and Jazz is '50s through '70s. "DW Classics have the mahogany-poplar-mahogany sandwich which characterised the original Gene Krupa 1930s Slingerlands"
Jazz is warm, punchy, more resonant, more suitable for high jazz tunings. Classics is darker and thuddier, with little sustain." The main shell comprises a thin (1/36") outer and inner veneer of rich red-brown mahogany with a stout (1/8") core of poplar, bounded by deep reinforcing rings of 10-ply maple, extending 2 1/4" down into the shell. Each ring is so deep that the top bolts holding in place the round nut boxes pass right through it. Just as surprising, the bearing edges are smoothly rounded over with no sharp apex. The closest to this I've seen is on Slingerland's Radio King toms and bass drums, which led the pack in the 1940s. DW's shells, though, are rather better finished. The snare has a completely different shell. Echoing the all-time classic Radio King snares, DW's is a single plank of maple, with maple reinforcing rings. But DW's innovative SuperSolid process entails making the shell and reinforcing rings out of a single plank of maple, bent and scarfed with a single join. The shell and edges are one, not glued together. See DW designer John Good's impressively clear explanation below. The process starts with a much thicker maple plank than previously possible and via a "molecular compression process" the wood is made sufficiently pliable to bend. The resulting ultra-thick and dense cylinder is then shaved back to accommodate the inch-thick reinforcing rings, while the body of the shell is reduced to 3/8", 1/2" or 3/4", depending on your preference. The review drum was 3/8" thick. Finally, the 45 degree edges are routed to a sharp outer point, giving maximum head coverage. The whole thing is beautifully finished, the edges superb, and as a bonus of this remarkable hi-tech process the shell really is perfectly round. Drums are made to order and as yet only available in plastic wrap finishes. Sizes are appropriately retro with a choice of three 14"-deep bass drums. There's a cool winged badge and beautiful, bulked-up retro bass drum 'T' rods and claws. We were disappointed that the bass drum hoops were not inlaid but just covered in Green Glass glitter wrap. For this money we'd expect vintage inlaid hoops. Sound-wise, the big factor is the blunt, rounded 'butter' bearing edges which are alien to modern drums. The rounded edge produces a softer, thicker attack with shorter sustain - and to go along with it a warmer, darker tone - and there is greater head-to-wood contact, imbuing the sound with more of the earthy, woody timbre of the shell. "The whole thing is beautifully finished, the edges superb and the shell really is perfectly round"
Turning to the 14"x5 1/2" snare, the sweet spot for us was with medium-high tuning top and bottom, with medium slack snares for a chunky response, every beat jumping right out. The dense, heavy shell brightens the tone and the four air holes ensure it breathes while slightly drying the beat and shortening sustain. While the centre is terse, the edges ring openly, although the thick reinforcing rings and heavy 3mm steel hoops keep the drum under control. Since the 45 degree edges peak right on the outermost edge you get a sensitive response all over the head, right to the rim. You could play anything on this drum, from orchestral to punk. As for the 22"x14" bass drum, fitted with two full white heads and simple felt strip dampers, we're right back to pre-'70s - before the explosion of head types complicated matters. It's easy to forget how good a 14" deep kick sounds with just coated Ambassadors. A big loose wet slam, not the dry dark biff of today's 20" deep kicks. You can feel the heads rattle, they're so close to one another. The obvious complement to the kit is DW's 6000 series hardware. It, too, is vintage style, single-braced with a stylish modern twist. The lightweight, flat-based tripod legs are squared aluminium with bent stabilising struts. The upright tubes are narrow-gauge but strong enough for most gigs, while TechLock toothless tilters and squared memory-lock housings complete a natty package. The review kit had DW's 770 'banana' tom mount (pictured above), continuing the vintage experience. It's massively stronger and more stable than vintage consolettes. However, the mounting clamp which attaches to the rail is secured underneath the rail itself, which is awkward. Once set it's solid, although the tom inevitably bounces around a little. Just remind yourself that Bonzo and Buddy made do with much dodgier consolettes and I never saw their toms fall off. Still, you can always place your small tom on a snare stand, or mount it from a cymbal stand using the tom's supplied STM bracket. In the latter case you'd probably want a heftier stand than the 6710. Likewise, with the snare being so heavy, you might consider a beefier cradle than the 6300.